Games have infiltrated popular culture and fundamentally changed the way we interact with the world. Yes, really. Press Start! 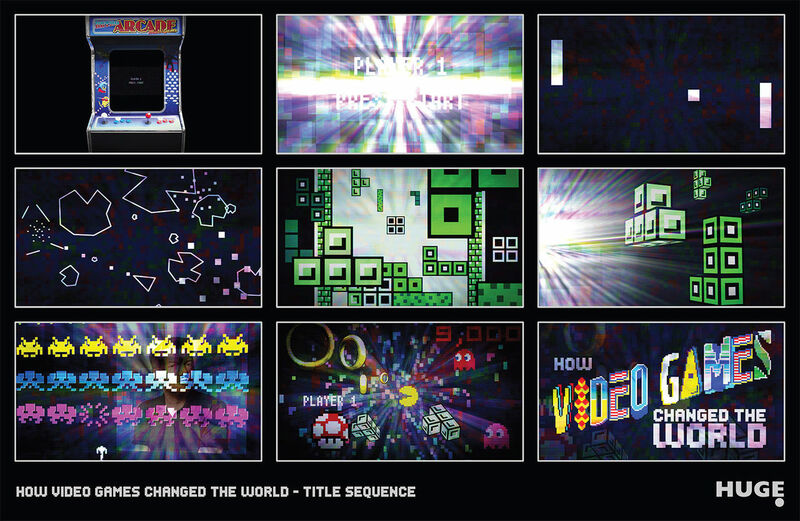 Relive those gleeful afternoons of yesteryear spent hunched over arcade cabinets or staring intently into a cathode ray tube with Huge Designs’ title sequence for How Videogames Changed the World. The Channel 4 TV doc is a refreshingly mainstream examination of, well, how games have changed the world from caustic English media commentator Charlie Brooker. 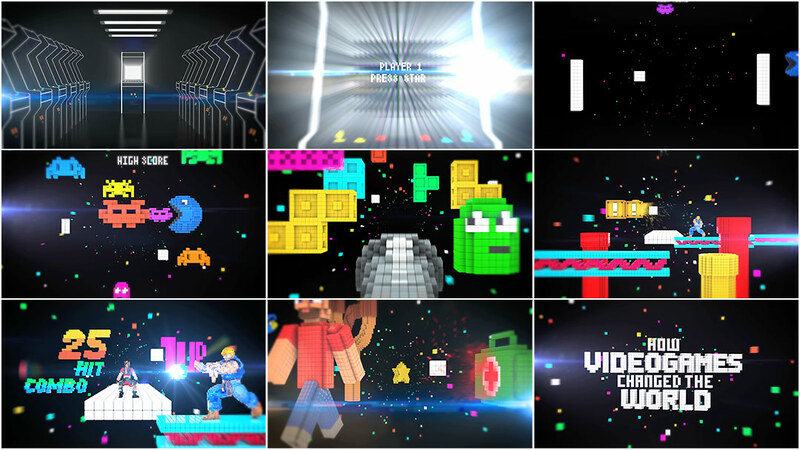 Led on by the blocky star of Pong, viewers take a voxelated trip through video game history filled with power-ups, multi-hit combos, and more nostalgia than you can shake a joystick at. All the familiar characters are there − even the Angry Birds − but this is more than just a parade of pixels, polygons, and pubescent recollections, it’s a visual exploration of how one of our most important mediums evolved. A discussion with Creative Director JOE LEA of Huge Designs. My name is Joe Lea and I have been working in animation and motion graphics for about six years. In the past two years, the majority of my work has been in title sequences and I’ve had the pleasure of working at both Huge Designs and Momoco. I was nominated in 2012 for an Emmy Award for my work on the title sequence for Strike Back, produced at Momoco. I was also part of the team for the Emmy Award-winning sequence for Great Expectations. How Videogames Changed the World are the first titles that I’ve directed – hopefully the first of many! So, how did you set about developing this title design? When pitching this sequence, we had no idea which games were going to be featured in the show, so Hugo Moss and I brainstormed a list of games we’d feature if we were producing the show ourselves. The majority of the games we picked were retro ones like Pac-Man and Asteroids, as they have a very iconic look to them and are instantly recognizable unlike many of the modern games we have now. It wasn’t until we won the pitch that the producers sent us the 25 games they were going to feature in the show. They were very specific about what games they wanted to see. It was then just a matter of going through that list and trying to pull out something iconic or eye-catching about that game that we could include. Games like Pac-Man and Space Invaders were easy, but when we got down to the bottom of the list with Grand Theft Auto III and Call of Duty it got a little tricky. In the end, we pulled it off even if you don’t see them right away. Tell us about the music. At what point did that come in? The music for the sequence actually comes from the classic Robocop game for the Nintendo Gameboy by Jonathan Dunn. Charlie Brooker, the writer and presenter of the show, is a big fan of the soundtrack for this game and was the one who persuaded us to use it. We had been keen to get a composer in to write something bespoke, as then we would’ve had a chance to add some sound effects, but once the song was cleared, one of the editors on the show cut out a section for us to use in the sequence. The original track is a 10-minute long looping onslaught of blips and bloops, and somehow it just seemed to work perfectly with the animatic that I had produced. From there I just jumped headfirst into getting the animation done. 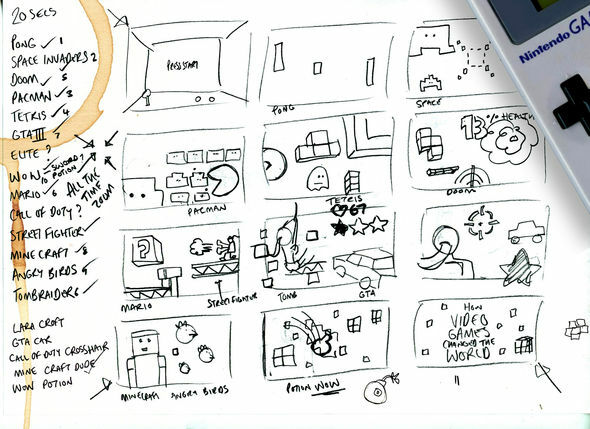 Did you do any sketching or storyboarding? When I pitch on any title sequence I always try to have some kind of logic or story running through the style frames I design. 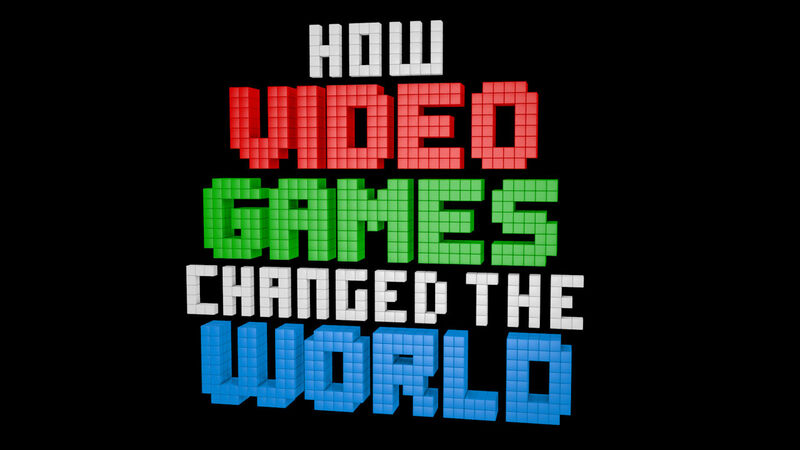 For How Videogames Changed the World I wanted to have a journey through the history of games within an arcade machine. When we won the pitch, Charlie sent us a link to a video featuring Minecraft. 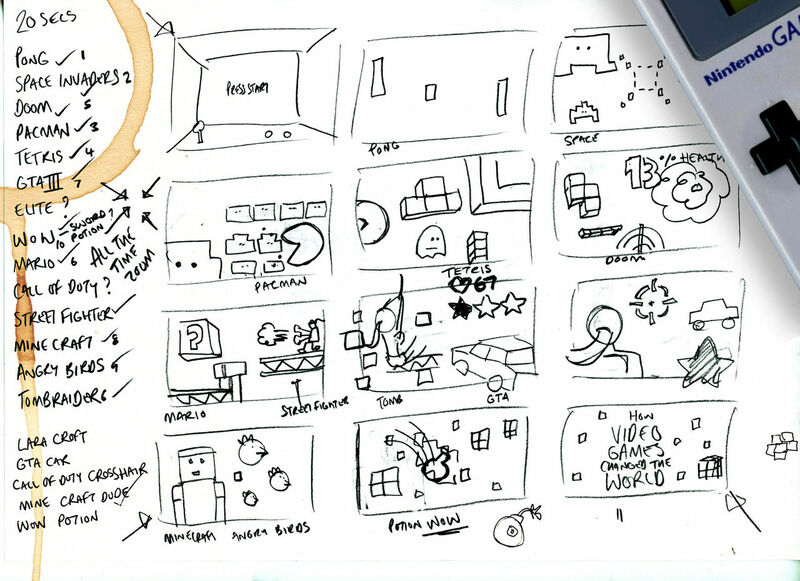 In the video, the camera is travelling forward throughout, travelling through these infinite landscapes that you can create in the game and Charlie’s main comment was that he liked the sense of movement or travelling from the video, so I started drawing up some thumbnail sketches of the elements I was going to use and the order that we would see them in. I then got straight on with creating an animatic which expanded on those thumbnails. I find doing animatics a lot easier than storyboarding. With an animatic, depending on how elaborate you make them, you can start getting a sense of movement and I find these a lot easier to sell to a client than my really rough thumbnail sketches. Was the show’s logo already there, or did you develop that as well? I designed the show’s logo. Originally I wanted to create it using letters taken from the boxes of old computer games which you can see an example of in my pitch frames. Unfortunately, though, that logo made the show look like a kids’ program. We were asked by the client to design something very clean and simple due to the fact it was a show for adults and had been commissioned through Channel 4’s art and documentary department. So the logo was stripped back to just a simple DOS font, but this worked well with all the blocks so there was a silver lining in the end. What was your timeline for this project like? We had roughly 6 - 8 weeks to complete the project from when we won the pitch. This included creating the title sequence as well as designing a 1-to-25 countdown graphics package and three 10- to 15-second blueprint/explanation animations to accompany the show. How big was the team for this project? What hardware and software did you use? The team was pretty much just me as the budget didn’t allow for us to get anyone else in. I figured out most of the tricky parts of the animation within the first week so it seemed fine to leave me to it. I also had Hugo and Paul McDonnell at Huge Designs to guide me and impart wisdom when I needed it. We also had Tamsin McGee work on some of the designs for the graphics we had to provide for the show. The sequence was created in Cinema 4D and then composited in After Effects where I added some action and lighting effects. A major hurdle I had was when I decided that the sequence was going to be in 3D and I wanted all of my models to be made out of blocks. Now, this is all well and good when you're modelling Space Invaders as they have an 8-bit design and it is relatively simple to model them using cubes, but my real problem came when I was looking to model and animate something like Lara Croft. Luckily I found a plugin for Cinema 4D called Voxygen by Tools4D, which instantly converts a geometric object into a mass of cubes. This saved me a whole heap of headaches and ultimately meant I didn’t need to get someone else to figure it out for me. What was it like trying to distill so many years of gaming history into 20 seconds? It wasn’t that tricky! Especially with the older games as they all have iconic imagery and designs to them, but some of the modern games became tricky. One game we had to eliminate from the sequence was World of Warcraft. There is so much content in it that trying to distill the game into one object or character was nearly impossible. 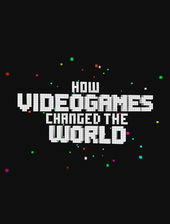 How do you think video games and gaming in general have changed? I think video games and gaming have had their ups and downs. Gaming first started at the arcades and it was a very social endeavour – you would go with your friends and compete to get the high score on your favourite machine. Then video games came into the household and it became a very isolated hobby. But with the rise of internet and mobile gaming I think we are seeing another kind of golden age. If you look at games like Candy Crush and Angry Birds, these are the types of games that would have been popular in any decade, the only difference is that they are reaching a much broader audience than ever before. And with the video game industry outgrossing the movie industry of late, I would predict in the near future that we will consume the majority of our entertainment by being a part of the action and interacting with the narrative that we are watching or playing. Do you have any personal favourites you wanted to include? *The 1990s was dominated by the rivalry between Nintendo and Sega's consoles: the Super Nintendo Entertainment System (the Super Famicom in Japan) and the Mega Drive (named the Sega Genesis in North America due to trademark issues). Nintendo was able to capitalize on its previous success in the third generation and managed to win the largest worldwide market share in the fourth generation as well. Sega was extremely successful in this generation and began a new franchise, Sonic the Hedgehog, to compete with Nintendo's Mario series of games. How have video games changed your life? I think people from my generation might be more adaptable to new technology as we are used to using a series of commands or buttons to achieve something. Other than depriving me from exercise and sunlight as a child as I would stay indoors trying to defeat Dr. Eggman in Sonic the Hedgehog, I think I turned out alright. Working within the animation industry there's all kind of chances that video games will change my life, though. Who says I won’t be directing the title sequence to the next big game? What are your personal favorite title sequences? It will sound like a cliché but I really like the old Doctor Who titles. The design and music are so iconic in Britain and considering they were done back in the ’60s and ’70s they still look fresh today.